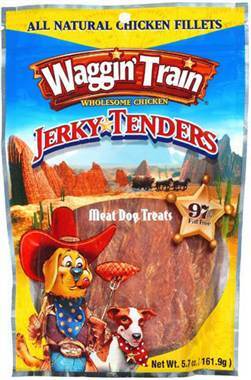 Waggin' Train chicken jerky and other brands recalledYes, Waggin' Train, LLC, and Canyon Creek Ranch, wholly owned subsidiaries of Nestlé Purina PetCare Company, import their chicken jerky treats from China, and today those brands of dog treats were recalled voluntarily. This recall was instigated by the New York State Department of Agriculture and Markets, which found trace amounts of antibiotic residue in samples of chicken jerky marketed under both brand names - Waggin' Train and Canyon Creek Ranch. When will U.S. importers learn? No pet owners have reported injury or death from these treats to date. Nestlé Purina says there is no cause to worry about your pets chewing or ingesting the treats because the amount of antibiotic residue, which is legal in China and several other countries, is minimal - some number of parts per billion. Nevertheless, Nestlé Purina has issued a country-wide recall of both the Waggin' Train and Canyon Creek Ranch brands of chicken jerky treats. Because the use of antibiotics is illegal in animals raised for human or pet consumption in the U.S., importers of these products to the U.S. need to reconsider their commercial sources, don't you think? Isn't it about time? How many pet food products and pet toys made in China need to be recalled before the manufacturers get it? And that goes for consumers too. Why don't you stop patronizing companies - not just boycotting certain products - that manufacture pet food or pet toys in China or anywhere else that have ignored U.S. laws that have been hard fought to protect our pets? This jerky recall stuff has gone far enough!